In May, after graduating from graduate school and progressing in the subsequent job search, I began to realize that my time in Los Angeles was coming to an end. I wanted to cap my two years of great burgers and not-so-great burgers (and, you know, an entire graduate education) with a real show stopper. The problem was, my list wasn’t even close to finished. 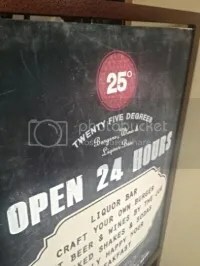 After asking around and taking in all my options, I landed on 25 Degrees in the historic Roosevelt Hotel. I was promised a great burger and a spiked milkshake to wash it down with. My fondness for spiked milkshakes is well documented, and I couldn’t pass this one up. 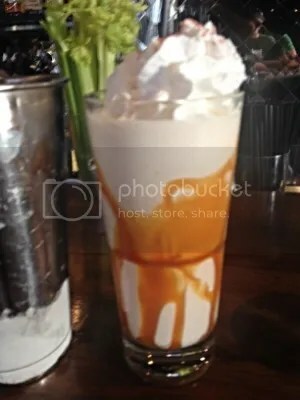 I opted for the Salty Caramel, a milkshake made with vanilla ice cream, butterscotch, and a generous pour of Makers Mark. It was so stiff I practically needed a chaser. Mind you, I’m not complaining. It was great, as promised. And it was expensive, so I didn’t mind the potency. Expensive, that’s the recurring theme of the evening. Not only was the milkshake $13, the burger was $14, and the fries were an extra $4. Add in a tip, and the total for one meal came to nearly $40, just below my record burger expense. Unlike Zuni Café, however, this burger was excellent. I mean, really, really good. 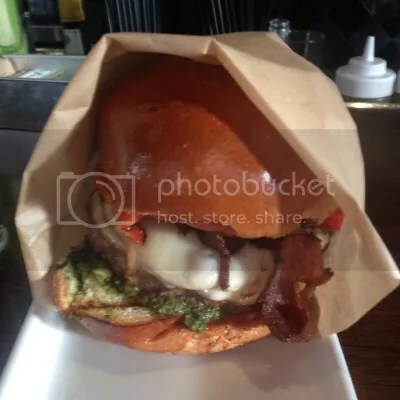 I built my own burger with a ground sirloin base, jalapeño bacon, roasted red peppers, pesto, and smoked mozzarella cheese. The bun held all of these toppings together, and managed to be soft and palatable all at the same time. The roasted red peppers were great, and the jalapeño bacon, while not particularly jalapeño-y, was still cut thick and cooked perfectly. And yet, even though the toppings were great, I didn’t need them. The ground sirloin patty was on point. Flavorful all on it’s own, it was independently delicious, in a class with my old favorites, The Apple Pan and Gabby’s. Any toppings were just a bonus that placed this burger among the very best I’ve ever had. I was hoping to end my time in Los Angeles with a bang, and 25 Degrees packed enough of a flavorful punch to leave me satisfied with it being my last. If you don’t mind dropping a few extra bones, you can’t do any better than 25 Degrees. I’m on my way to New Hampshire (though you can expect a few cross-country reviews as I go). What burgers should I try in New England? As always, let us know in the comments.